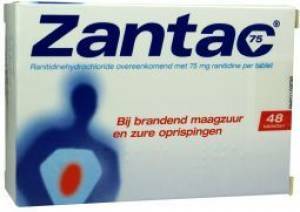 Zantic (Zantac) prescriptions are currently not available via our online consultation service. You can, however, request an online consultation for gastro health. Zantac tablets, effervescent tablets, syrup and injection all contain the active ingredient ranitidine, which is a type of medicine called an H2 receptor antagonist. (NB. Ranitidine is also available without a brand name, ie as the generic medicine.) Ranitidine acts in the stomach to decrease the production of stomach acid. Ranitidine works by blocking histamine H2 receptors that are found on the cells in the stomach lining. A natural body chemical called histamine normally binds to these receptors, causing the cells to produce stomach acid. By blocking the H2 receptors, ranitidine prevents histamine from binding to them. This stops the cells from producing stomach acid. Stomach acid is produced in the stomach as a normal part of the digestive process. Normally the linings of the stomach and duodenum (an area of the intestine directly after the stomach) are protected by a layer that resists acid attack. However, if this layer is damaged, or large amounts of stomach acid are formed, an ulcer can develop on the lining of the stomach or duodenum. This is called a peptic ulcer. Acid produced in the stomach can also sometimes flow back into the food pipe (oesophagus). This is called gastro-oesophageal reflux, and can cause pain and a burning sensation known as heartburn. It can also irritate and damage the lining of the oesophagus, causing a condition called reflux oesophagitis. By reducing the production of stomach acid, ranitidine can be used to treat all these and other conditions. It stops excess acid flowing back into the foodpipe and can be used to relieve heartburn symptoms associated with acid reflux. It also allows the oesophagus to heal in reflux oesophagitis. By reducing the amount of acid in the stomach and duodenum ranitidine relieves the symptoms of indigestion. It also allows peptic ulcers to heal, and prevents them from recurring. Ranitidine can be given together with antibiotics to help eradicate bacteria called Helicobacter pylori from the stomach. These bacteria can contribute to the formation of peptic ulcers. Ranitidine helps create an environment in the gut in which the antibiotics can be more effective at killing the bacteria. Ranitidine can also be used to prevent and treat peptic ulcers that can occur as a side effect of non-steroidal anti-inflammatory drugs (NSAIDs), such as diclofenac. Ranitidine is also used to depress stomach acid production in various other conditions. It is used in varying doses and for varying lengths of time depending on the condition being treated.